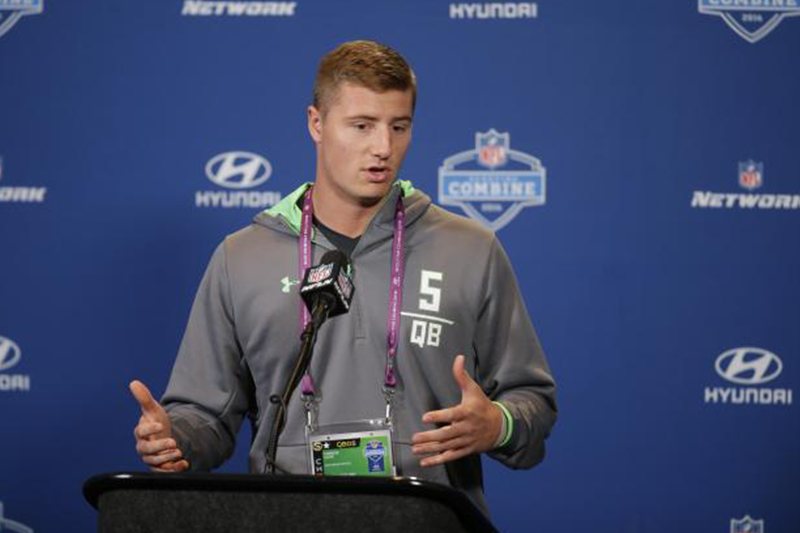 ALAMEDA, Calif. — The Oakland Raiders are going with rookie Connor Cook at quarterback in their wild-card game against the Texans. Cook gets the nod with Pro Bowler Derek Carr out with a broken leg and backup Matt McGloin nursing a shoulder injury that could make it tough for him to practice enough before Saturday’s game at Houston. Cook will be the first quarterback ever to make his first career start in the postseason. Despite appearing in just one game as a rookie, the Raiders (12-4) say Cook showed some “swagger” when he replaced McGloin in the second quarter on Sunday in Denver, and has their confidence heading into the game against the Texans (9-7) because of what they’ve seen all year. Del Rio said they hope that McGloin will be healthy enough by Saturday to be Cook’s backup, but that he was still “pretty sore” on Wednesday. Cook was a fourth-round pick this year after a four-year career at Michigan State where he threw for 9,194 yards with 71 touchdowns and 22 interceptions. Del Rio said they like the way he’s worked and developed since he was drafted and think that his pedigree in big games in college should help on Saturday.